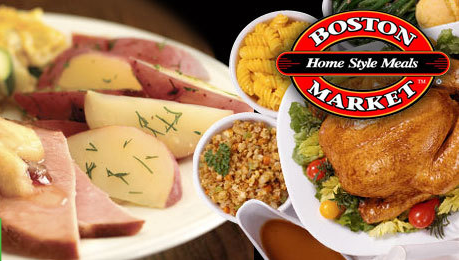 $15 For $25 Boston Market Gift Card! Hurry! This offer is good today and tomorrow only! "Pay just $15, and you’ll get a $25 gift card to Boston Market — where fresh and flavorful home-style meals are served up in a flash – ready to be enjoyed when you are. Grab this deal, and then share it with your foodie friends via Facebook, Twitter, or email, so you can all feast on slow-roasted rotisserie and mac-n-cheese together - for 40% off! At Boston Market, wholesome ingredients and tasty spices live together in perfect harmony. Even though they cater to busy schedules, everything on their gourmet menu is cooked with care. Come in for the quality meats, but stay for the wide selection of rich and creamy side dishes cooked to perfection. It’s pretty much Thanksgiving year ‘round - as it should be!" "Limit 1 per household. Deal is good for 1 genuine BOSTON MARKET Gift Card that will be mailed to your address once redeemed. Offer cannot be redeemed until 24 hours after voucher is received here. Although this gift card NEVER expires, this voucher must be redeemed within 60 days from date of purchase. Gift Card will be shipped via standard shipping to address provided on redemption site. No worries, there are no shipping charges to you and no hidden fees of any kind. Step-by-step redemption instructions will be on your voucher. This BOSTON MARKET Card may only be used for purchases at participating BOSTON MARKET stores."